Vehicles that offer third-row seating are a fantastic choice for large families. 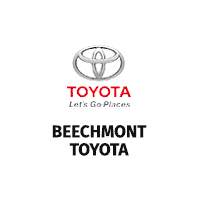 Find the perfect Toyota vehicle for your family with options ranging from minivans, hybrids, and SUVs. Toyota 7 passenger vehicles offer the versatility you need whether you’re carrying passengers, cargo, or a mixture of both. Both Highlander and Highlander Hybrid offer seating for 7-8 passengers. Comfortable seating, increased cargo space, and silencing insulation materials combine to produce a refined interior. Rear-seat passengers will love the available Blu-ray Disc™ entertainment system along with 5 USB charging ports. Fold down the 60/40 split third row seat to fit cargo with ease. An available panoramic moonroof lets you and your passengers enjoy fresh air and sunshine, making those long road trips much more pleasant. 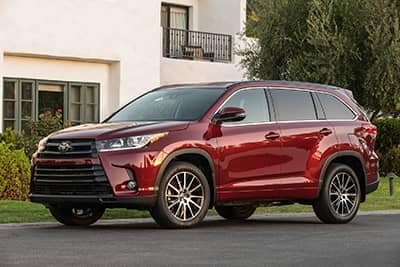 Toyota Highlander can be equipped with a 5,000 lb towing capacity, allowing you to bring along all of your gear with confidence. Highlander is sure to be a hit with any growing family. Rugged and durable are two words that best describe styling of the Toyota 4Runner. 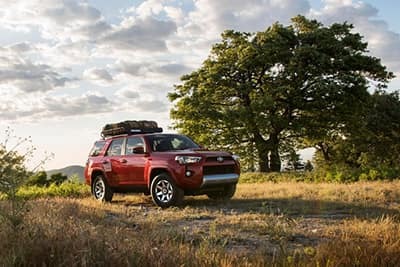 7 passenger seating is available on select models of 4Runner, meaning you can bring everyone along for the adventure. Simply fold down the 50/50 split third row seat when not in use to expand cargo capacity. The sliding second row seating offers simple one-touch passenger-side access to the third row. The available Entune® App Suite on 4Runner comes loaded with apps including Facebook Places, Yelp®, iHeartRadio, and Slacker Radio. An optional JBL® 15 speaker audio system should impress music fans. Parking the Toyota 4Runner is nearly effortless thanks to the standard integrated backup camera with optional sonar sensors. Power and versatility are two reasons why Toyota Sequoia is the perfect full-size SUV for large families. Comfortable seating for up to 8 passengers combined with a massive 120.1 cubic feet of cargo storage prove that Sequoia is ready for any adventure. Platinum and Limited Sequoia models feature power reclining third-row seats, which fold flat at the push of a button. Optional heated/ventilated leather seats, second-row climate controls, and a rear-seat Blu-ray Disc™ entertainment system are only a few highlights of the comfortable interior of the Sequoia. A roof rack comes standard for hauling additional cargo. 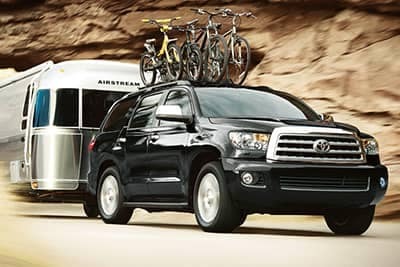 Toyota Sequoia has a towing capacity of up to 7,400 lbs, meaning that even the largest cargo or gear can come along for the journey. An icon for over 60 years, Toyota Land Cruiser is a sophisticated blend of off-road prowess, on-road comfort and unparalleled refinement. Featuring seating for up to 8 passengers, Land Cruiser is up for any situation. The 50/50 split third-row seats fold away against the interior to reveal a cavernous 81.7 cubic feet of cargo capacity with the second row folded down. The center console in the Land Cruiser features a built-in cooler box that is perfect for snacks and refreshments on long journeys. A standard JBL Synthesis® 14 speaker audio system, Entune™ Premium JBL® Audio with Integrated Navigation and App Suite, rear-seat DVD entertainment system with two 11.6-in. 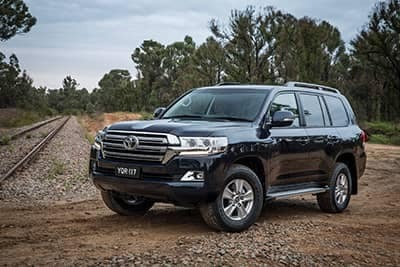 display screens, and Multi-terrain Monitor are only a few of the impressive tech features offered in the Toyota Land Cruiser. 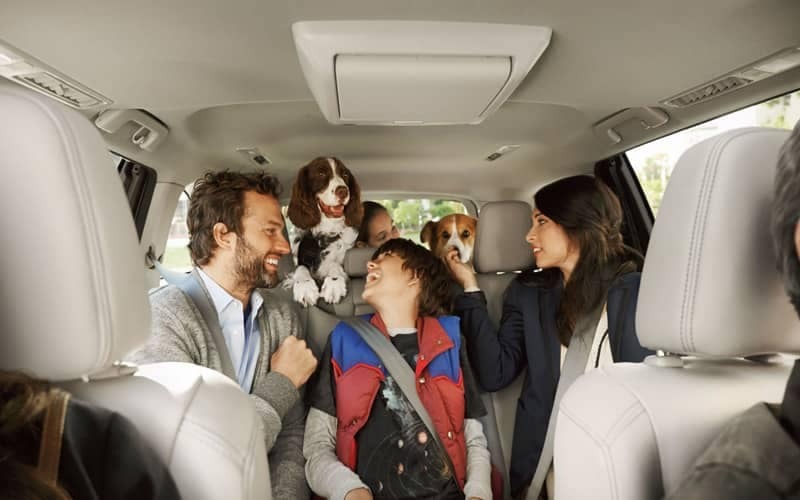 Toyota Sienna offers space for up to eight passengers, which lets you load up family and friends. An available Dual-View Blu-ray Disc™ Entertainment Center with 16.4-in. display will keep passengers entertained as the miles fly by. Sienna features standard three-zone automatic climate control with a separate rear control panel, allowing everyone to stay comfortable regardless of their preferences. Split & Stow 3rd Row™ seating allows the third row to be stored flat in a dedicated storage compartment, freeing up additional cargo space. 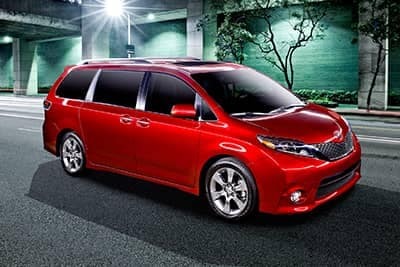 As the only minivan available with all-wheel drive, Toyota Sienna is able to go where other minivans fear to tread. The available power liftgate opens in a matter of seconds and can be closed from the comfort of the driver’s seat, safely out of the elements.